36 Comics from the personal collection of artist Michael Zeck! 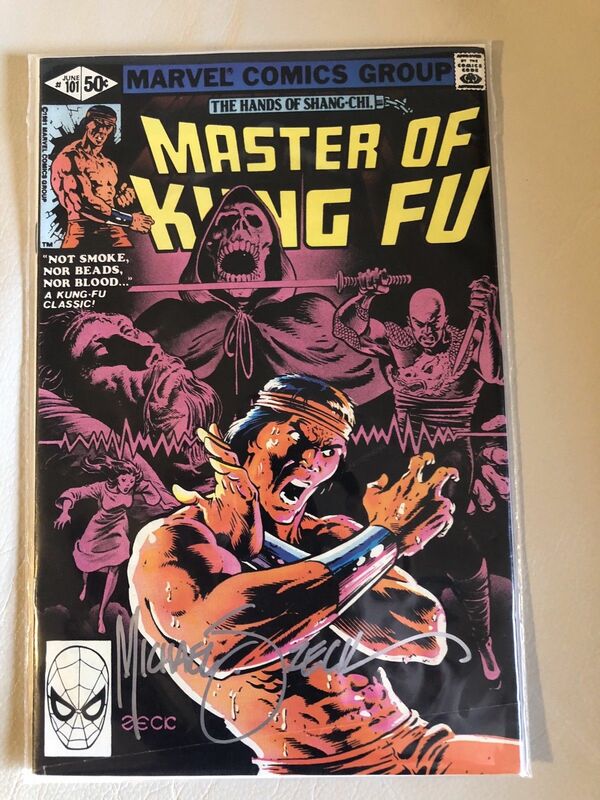 Each comic is signed on the cover and comes with a signed certificate of authenticity showing that these comics come from Mike Zeck’s personal library and have been in his collection since the time of publication. Zeck is well known for his work on The Punisher, Captain America and Marvel Superheroes Secret Wars. These were purchased directly from Mike and represent his entire run on Master of Kung Fu. Each one is $29.99 plus shipping. Please contact me at mike@collectorsatticva.com if you are interested in purchasing these one of a kind items. 55, 59, 60, 64, 66, 67, 71, 72, 73, 74, 75, 76, 77, 78, 79, 80, 81, 82, 83, 84, 85, 86, 87, 88, 89, 90, 91, 92, 93, 94, 95, 96, 97, 98, 99, 101.